A lot changes in three years, especially in the social networking space. 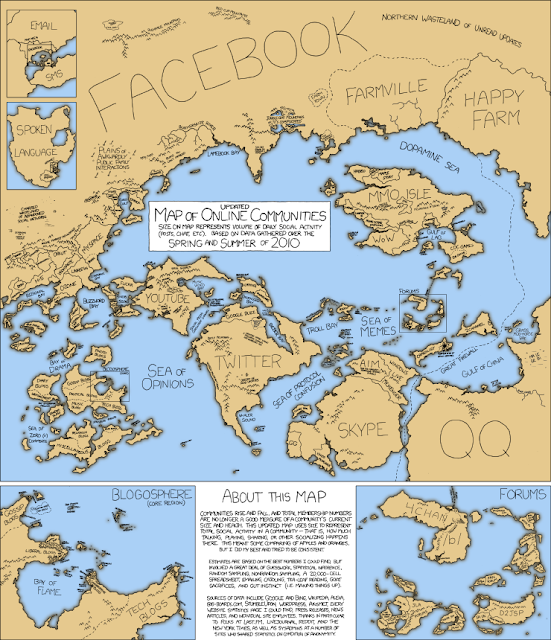 The mind behind xkcd comics – “a webcomic of romance, sarcasm, math and language” that has garnered a large following of the geeky sort – has updated his original 2007 Map of Online Communities to show what happens to social networks over time. The most significant change? The mountainous region of Facebook has experienced massive geological growth, expanding from a small nook hanging off MySpace to become the uber-continent dwarfing the other social network islands, bays and territories. Check out the full 2010 Map of Online Communities below. While the 2007 Map of Online Communities measured a network’s size by the sheer number of users, xkcd has refined his measurements for 2010 – the size on this map represents the volume of daily social activity on the site, like messages, status updates and games played. Take a look at the Map of Online Communities 2010 below and notice the dominance of Facebook, the Great Firewall of China blocking QQ and Happy Farm off from the rest of the land masses, and the perseverance of MMO Isle. If you have some spare time, it’s worth heading over to the larger image of the 2010 Map and looking at some of the detailed landmarks that populate this world of social networks. For instance, take a gander at Twitter island – notice the Bieber Bay making inroads into the land? And how about the Sea of Protocol Confusion that separates Twitter from Skype? It’s probably no mistake that the large chunk of Facebook carved out in the name of Farmville is just underneath the Northern Wasteland of Unread Updates. 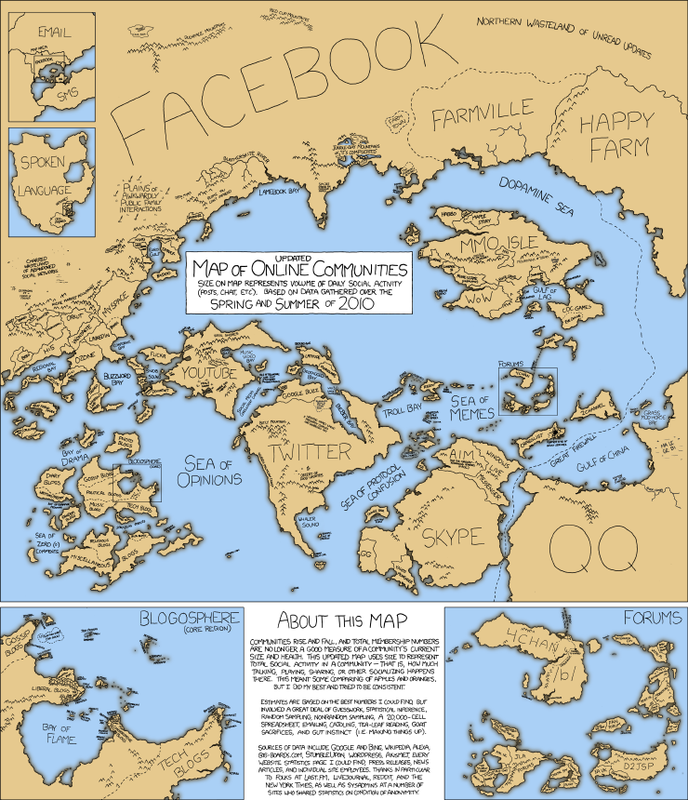 Since the 2007 map, lots more Facebook-specific land masses have cropped up – take a stroll over to the Plains of Awkwardly Public Family Interactions for some entertainment, or try to see if you can locate the Privacy Controls outpost in the pit of lava behind Duckface Mountains. This map follows on the heels of a Flowtown map that also paid homage to the original xkcd 2007 Map of Online Communities. Both 2010 versions show the dominance of Facebook, but it’s interesting to compare them to see how different measurements, perspectives and imaginations can create different social network landscapes.